Hanvon D10 Is a mobile office needs to meet the high-end people a mainstream product, stylish and simple. The world's first tablet PC "capacitor" + "electromagnetic" double screen paste techniques hand, pen dual control. And integrated HW text macro patented technology. 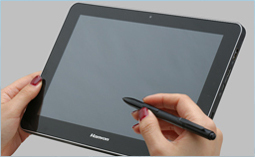 HW-specific the ERT electromagnetic screen, and electromagnetic pen technology. 3 capacitor electromagnetic dual-mode input, 1024-level pressure sensitivity. Perfect realization of the dream of handwriting technology embedded in the computer. Email "personal letter" real writing directly, smooth writing pen move your feet. Original handwriting annotation; Dictionary and TTS reading. The core of the integrated Hanwang face recognition technology to protect important data security. Adds to the HW characteristics of handwritten annotations, handwritten notes, OCR and Mail To function. Preset application upgrade firmware update service.